Most people’s definition of a dinghy would be along the lines of open, tiller steered and probably a tinny; and small. But a minor trend is seeing much larger boats that are open and tiller steered. Purist fishermen are buying them. They are still overwhelmingly made of aluminium, although you might hesitate to call a boat built of 4mm plate throughout - as the review boat is - a tinny. Also you do not find too many dinghies with self draining decks. Perhaps the review boat is a super dinghy. 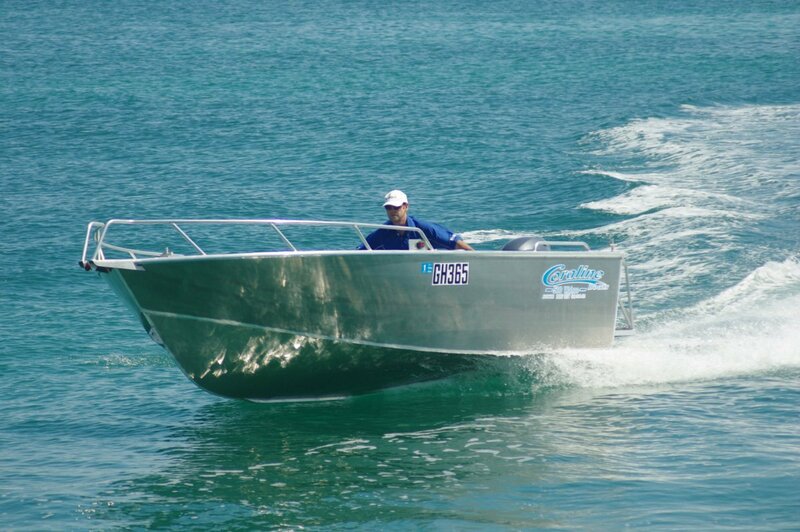 The Coraline 500 Wahoo with a hull length of five metres and a beam of 2.25 metres seems a very big boat in dinghy format. Its dominant feature is space. You could park a couple of full size cray pots on the deck without hampering the movement of three or four anglers. This boat was built to order, an order that specified no paint inside or out: one of the marks of a purist. The idea here is that a classy finish might inhibit vigorous use. Perhaps, too, the considerable dollar saving has its appeal. The driving position has been ingeniously arranged. The obvious set up aft would be a seat inserted on each side of the splash well, but Coraline did not do the obvious. The sides of the splash well taper down from the transom to a convenient height for a seat. The builder inserted a platform at that height to starboard of the well, projecting it 200mm or so ahead of the well and then across its front face. This leaves the port quarter clear for access to the boarding platform and makes the steering task simpler. Now, if the tiller needs to go fully to port the driver can slide across the seat instead of standing. You also gain a considerable volume of stowage beneath it. The location of the Garmin sounder-plotter combo is equally unconventional: between the starboard side pocket and the side deck above it. It is out of the way of anyone moving about, is protected from spray and best of all is conveniently under the driver’s eye. Two more seats are laid on; sockets half way up the deck accept pedestal seats. An advantage of these is that for trips with short travel times they can be left behind, any passengers sitting on the bow casting platform. As with every other horizontal surface this is carpeted. Underneath it is more stowage in two compartments. These will accept items you wish to keep dry, but they can act as catch tanks or ice boxes for drinks. Rails have been placed in the right places. Low rails aft provide a natural hold for the driver – in choppy conditions, just a hand on the tiller can feel a bit insecure. The bow rails are higher and extend aft beyond the platform. 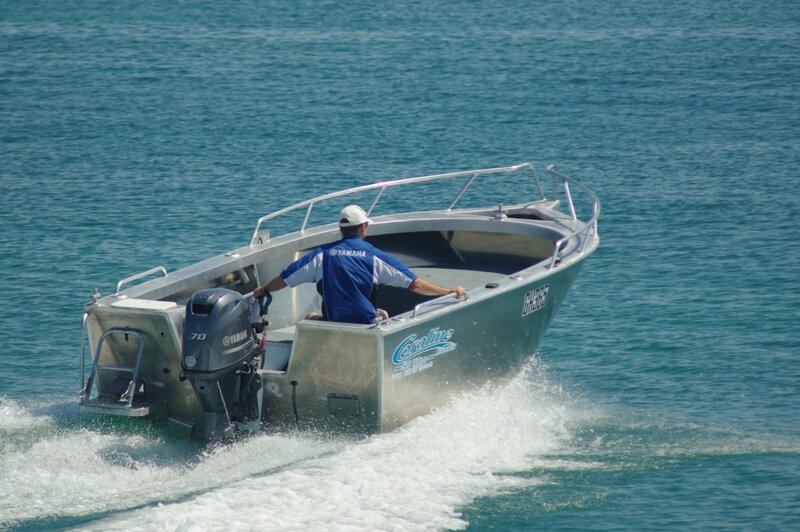 Apart from the wet lockers and the Garmin there is just a pair of specialised fishing features built in. There are four rod sockets, and these are the best: aluminium, welded in place. Stainless would require careful insulation to avoid dissimilar metal corrosion; plastic does not have the same durability. And there is a live bait tank within the transom, fed by scoop. Nowadays many anglers consider built-in stereo as part of the fishing fit out; purists feel that serious fishing does not need a sound track. 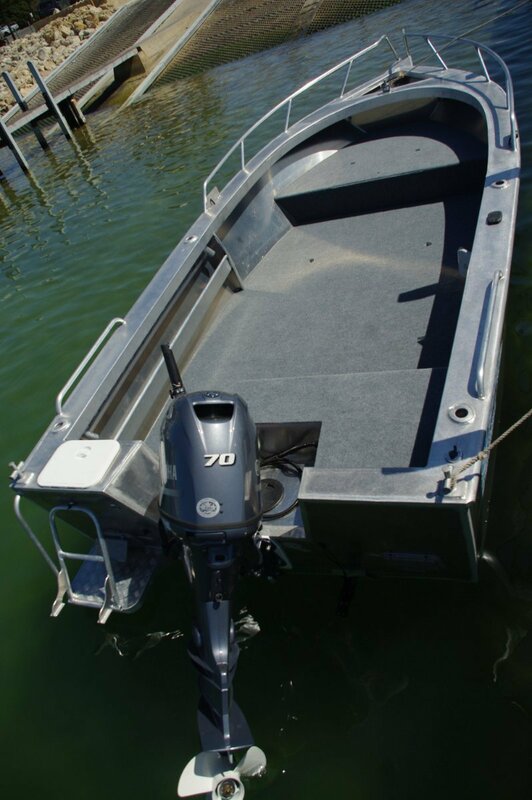 Despite the thickness of the hull plating, the lack of top works makes this a light boat; a 70hp Yamaha four-stroke provides it with serious power. The long tiller makes the boat easy to control, especially during low speed manoeuvring when big controlling movements are needed. In open waters the 500 is a delight. Trim controls are on the tiller as well as the throttle, so the old problem of big hand movements disappears: handling becomes a precision operation. The other feature of fishing boat operation, stability as people move around, is a non starter of a worry. Crowd the rails and there is barely an angle of heel to worry about. This is a bundle of ability within taut dimensions.